Felix and Fingers performers love that our show takes them all over the country. But we have to admit, some places are more fun than others. And you can’t go wrong with NOLA! 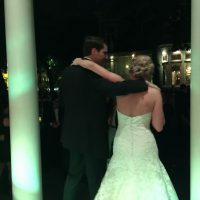 This New Orleans Elms Mansion Wedding was the perfect excuse to spend some time in the Big Easy. 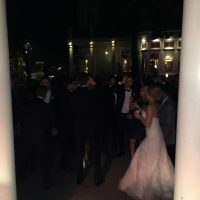 If you are searching for one of the finest wedding or event venues in Louisiana, we sure have the place for you. You will find the Elms Mansion in the famous Garden District on St. Charles Avenue. 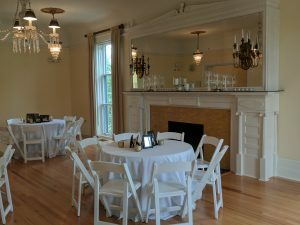 This is the only historic venue on “The Avenue” that is available as an event venue and we’re sure no one could hold a candle to the services, ambiance, and elegance they provide. The vintage home dates from 1869 and is full of gorgeous historical accents. The ornate woodwork will have your guests in awe as will the 48 foot ceiling in the ballroom. Everywhere you look there is opulence and splendor. It is just gorgeous, truly gorgeous. 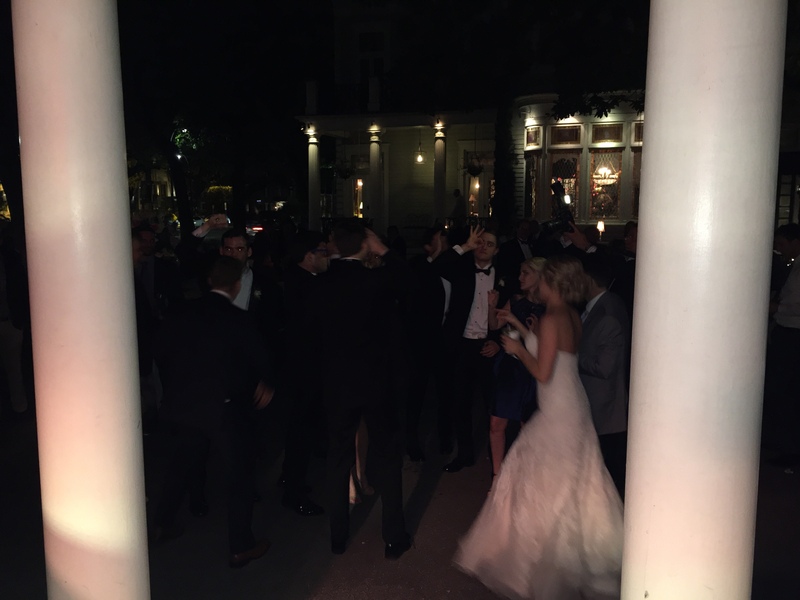 In addition to their beautiful property, the staff will make sure everything goes as planned. We found them to be of great help and also saw how well they took care of all of the guests. We were quite impressed with everything we experienced here. This was our second time performing at this exquisite mansion and honestly, we couldn’t wait to return. Hopefully we’ll be back for a third time in the very near future. What a fantastic place. Please click here to read more about the Elms Mansion and to peruse their beautiful photos. 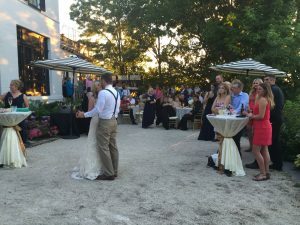 The entire reception took place in the charming outdoor courtyard. It was a beautiful evening and the sounds of music along with the stars made the night seem magical. 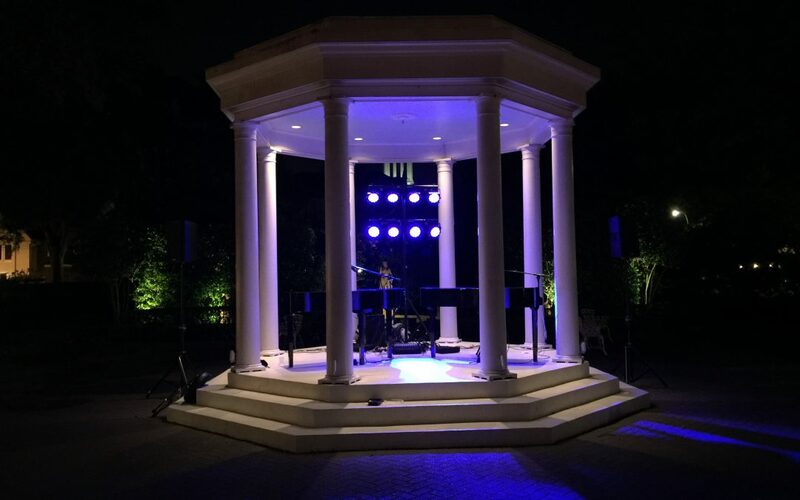 We set up our pianos under a gazebo and it wasn’t long before we had everyone singing, dancing, and laughing the night away. New Orleans is the birthplace of jazz and it certainly gave us a chance to practice. We love all of the traditional New Orleans tunes and belted out Dr. John’s version of Iko, Iko. Nina Simone’s Little Liza Jane is another popular New Orlean’s song and of course, there is always the famous When the Saints Go Marching In. The entire night was just perfect and we couldn’t have been happier with another chance to travel to this city and be a part of its incredible and historical music scene. 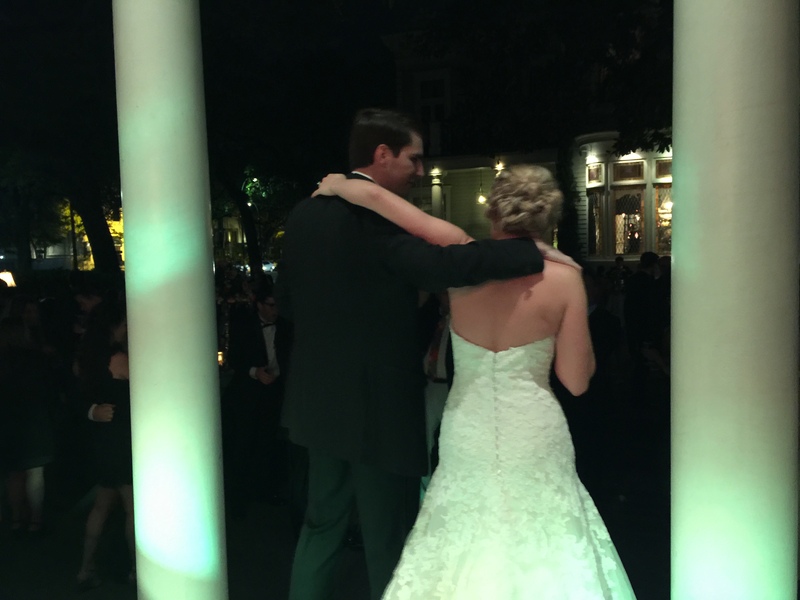 Yes, we’re based in the Chicago area but just like we did for this New Orleans Elms Mansion Wedding, we’ll travel wherever you need us to go. Give us a call and let’s talk. You can find our information by clicking here and in the meantime, Laissez Les Bons Temps Roulez!